Karen’s Killer Fixin’s **AUTHOR SPECIAL** with DONNA FASANO! Welcome to my Friday bonus feature called Karen’s Killer Fixin’s **Author Special**!! Today, in lieu of one of my own recipes, I’m going to introduce you to a new author who will share one of her favorite recipes. Not only will you and I occasionally learn how to make something new and delicious, but we’ll get a chance to check out some wonderful authors. 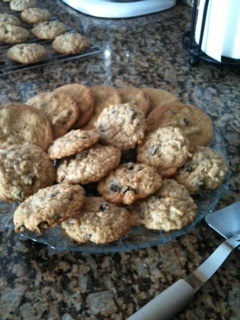 Introducing author, DONNA FASANO, and her favorite recipe for NOT YOUR GRANDMA’S OATMEAL COOKIES! Born in Elkton, Maryland, Donna Fasano met her knight in shining armor—a logical scientist type—when she was still a teen. They married, raised two children, and currently live in Northern Delaware with their wild-dingo-of-a-dog, Roo. Donna loves to read and has an eclectic taste when it comes to fiction. She collects cookbooks and loves to use them. She hikes, bikes, and kayaks (physical activity is necessary due to her love affair with food). Donna has been writing romance novels and women’s fiction since 1989. Her books have sold nearly four million copies worldwide, and she is pleased to be able to say she’s a USA Today bestselling author. Donna Fasano loves to hear from readers. Contact her through her website. 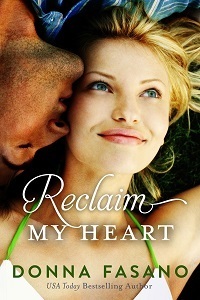 Her latest release – Reclaim My Heart – recently made it to #5 on the Kindle Top 100 List. I hope you enjoy the recipe Donna is sharing with us today on Karen’s Killer Fixin’s. Happy eating! P.S. We’re at 130 recipes and counting with this posting. Hope you find some recipes you like. If this is your first visit, please check out past blogs for more Killer Fixin’s. In the right hand column menu, you can even look up past recipes by type. i.e. Desserts, Breads, Beef, Chicken, Soups, Author Specials, etc. I don’t know where in the world you live, but here on the east coast of the US we are frozen—right smack in the middle of winter. There is one delectable treat I always make when cold weather hits. You got it. Oatmeal cookies. Sweet, chewy rounds of goodness that go perfectly with hot tea or steaming apple cider or a rich cup of coffee. Mmmm! However, these cookies aren’t like any your grandmother made—not unless she was privy to my secret ingredient, that is. What’s the secret ingredient? Shredded coconut. That’s what makes these mouth-watering morsels of oaty goodness so moist and delicious. So heat up the oven, pull out your best mixing bowl, and let’s bake up a batch of cookies. Preheat oven to 350º. Cream the butter and the sugars until light and fluffy. Beat in the eggs and vanilla. Add dry ingredients. Stir in raisins, oats, and coconut. Drop by rounded tablespoons onto a light greased baking sheet. Bake for approximately 15 minutes (or until golden around the edges). Makes about 4 dozen cookies. **SPECIAL ANNOUNCEMENT: Donna will give away one copy of RECLAIM MY HEART to one lucky reader who comments on her Karen’s Killer Fixin’s blog!! Don’t miss this chance to read this novel!! Thanks, Donna, for sharing your release and your fabulous cookie recipe with us! I had never thought of adding coconut to oatmeal cookies. I will have to bake some this weekend. Mmmm…cookies. I’m not fond of raisins, but I sure as heck should try this today since my daughter’s out of school. Thanks for the recipe! I hope everyone enjoys the recipe! What fun! I, too, have a spatula and a whisk that belonged to my mother-in-law that I cherish and use daily. Keeping those traditions!